An interesting article by Ian Smith on the hot topic of agent fees. Letting agents may be excused from feeling a bit like the mythical Greek character Charon, the ferryman of hades who carries the souls of the newly deceased across the rivers Styx and Acheron that divided the world of the living from the world of the dead. The rivers they negotiate on behalf of landlords and tenants are full of compliance. The irony can’t be lost on agents that the Government responsible for the flow of the river is now telling them that they can no longer collect their fares from the passengers (tenants), on their trip to hades (a tenancy with a Landlord). 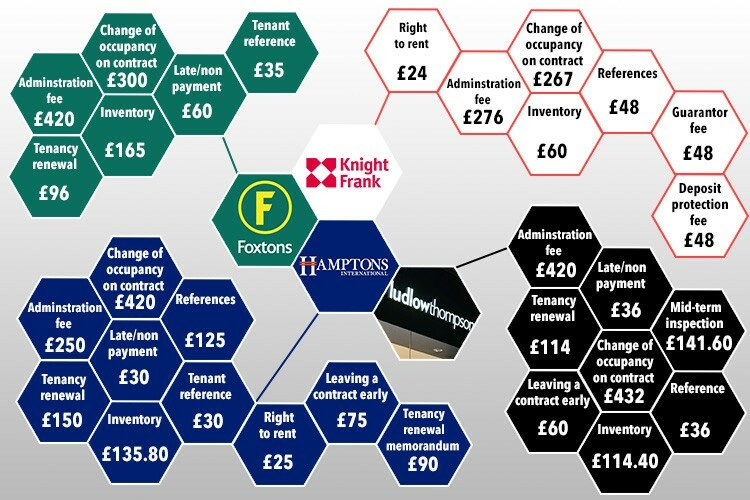 In the chancellor’s Autumn Statement it was announced that “Lettings agents in England will be banned from charging fees to tenants.” Lettings agents charge a range of fees for services to tenants as shown in the diagram below (Source: The Sun) and there is a general undercurrent, in most reporting on these fees, that they are regarded as excessive. An example of on boarding fees typically charged to tenants (Source: The Sun) In particular focus are the upfront fees, arising from a let-only service, often paid directly by tenants to Letting Agents at the start of a tenancy? Government figures show that tenants paid on average more than £200 in up front letting agency fees, on top of rent in advance and deposits. Higher average costs have been identified with one in seven tenants being charged more than £500.1 It is easy to get caught up in an emotive discussion about value (are the fees excessive?) and lose sight of the fact that the underlying services provided by Letting Agents do have a purpose and a cost. A significant part of the cost of a let only service arises from meeting the compliance obligations in marketing and establishing a tenancy. According to Property Information Made Simple (PIMS) who specialise in Landlord Legislation and Management, letting is fraught with compliance issues, as a result of significant new Landlord Letting Legislation and numerous revisions to the Housing Acts. They see this legislation as a punitive burden, characterized by over kill and confusion. The industry position presented by ARLA, The Association of Residential Letting Agents (the UK’s foremost professional body for letting agents) is that letting agents do not profit from fees. They believe the average let-only service fee charged by an ARLA licensed agent (£202 per tenant), is fair and reasonable and far from exploitative for the service tenants receive. Sally Lawson, a UK Lettings Business Professional and President Elect of ARLA recently claimed during an interview on Radio 5 Live that on boarding a tenant took 17 man hours per letting and this involved a lot of compliance work. The industry best practices identify a lot of applicable direct legislation involved in the process and focus particularly on money handling. These best practices should give tenants and landlords’ assurance that matters are being dealt with properly. One area that does not seem to be in focus is data protection. The process of on-boarding involves the collection… of personal details from various documented sources about a tenant (detailed below) and these are processed as part of tenant verification and referencing and then stored by each agency. Personal data examples: Names National Insurance Number Addresses Telephone numbers Job titles Dates of birth Sources examples: Records of rent payments Credit searches Utility Bills Bank Statements References The personal data may be in the form of structured data, entered into computer systems, or unstructured data (documents whether stored manually or digitally as scanned documents). In either format the holder of the personal data needs to be aware of their obligations under the Data Protection Act and from 25 May 2018 the implications of the GDPR (European General Data Protection Regulation). Failure to comply can be costly in both financial and reputation terms and the compliance cost and risk here is ignored by a business at its peril. The initial impact of the Autumn Statement is that Letting Agents will have to negotiate fees with landlords and that let-only service fees will no longer be recoverable upfront from tenants. This market dynamic may impact the level of fees, but ultimately there will be some level of cost for the landlord which may be passed on to the tenant in the form of increased rent. In the absence of all of the current level of fees being passed onto the tenants the margins of Lettings Agencies and/or landlords are going to be squeezed. Margin pressure will ultimately lead to changes in behavior which impact costs. To avoid the unintended consequences of these cost savings being directly, or indirectly, at the expense/risk of the tenants it is hoped that there is a focus on the improvement of processes like tenant on-boarding. For example, the introduction of intelligence augmentation software, like document management and workflow, which can automate processes, improving efficiency and control over both documents and the process whilst reducing the risk of error and loss of data. Such systems carry a bonus of knowing what data you have and allow you to tag when you can get rid of it, which significantly reduces the data protection compliance risks identified above.